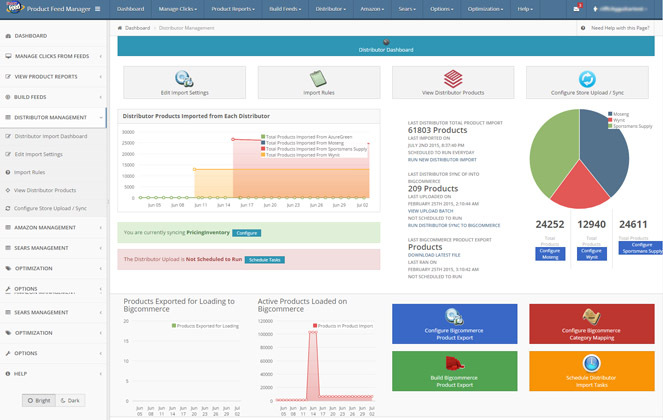 The SmartFeed Product Feed Manager Solution allows you to view product reporting for each product on each comparison shopping engine. Automate your feeds from your website with our automated product import. You can schedule your feeds to uautomatically and build any feed at any time, from anywhere, on any device! The Amazon Management Plug-in allows Amazon sellers to automatically load their products onto Amazon and map to existing ASINS. You can price against the lowest competitor, set rules and sync inventory with a sellers website. Try the Jet and Walmart Management Plug-ins allowing you to automate your stores products onto Jet or Walmart. You can price based on formuals, set rules and sync inventory. 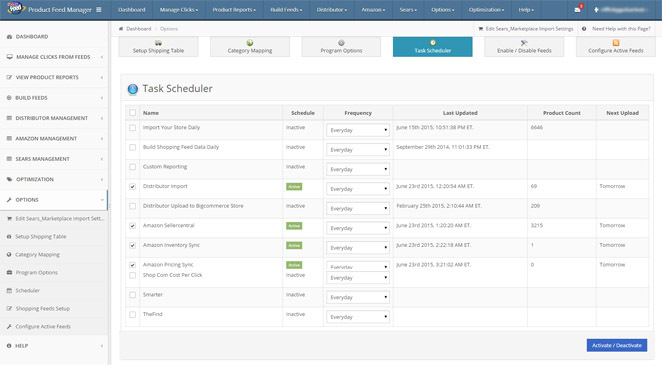 Use the Order Manager to manage your orders for Jet or Walmart or manage them within your store. The distributor import for product feed manager can be configured to automatically sync inventory and pricing changes from any number of distributors to your website. You can also load new products to your website based on various filters. You can make changes to your feeds, access reporting, build new feeds, add products to Amazon or other marketplaces, from anywhere on any device right from our easy to use interface that is optimized for mobile devices. This short video reviews our features and our various services. 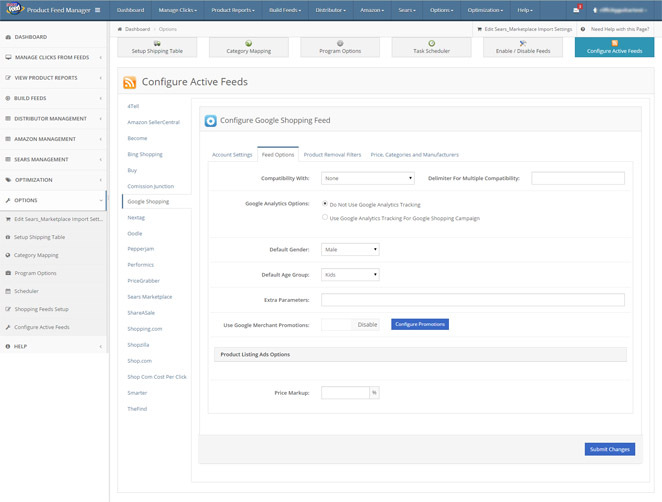 Automate Feeds to Comparison Shopping Feeds such as Google Products, Nextag, Shopzilla, Pricegrabber while viewing the inbound traffic from each shopping engine. View all supported shopping engines here. Automate Products to Amazon, Jet, Walmart, Sears, Rakuten, Newegg, and more while syncing pricing and inventory changes, set parent and child relationships, link to existing asins. Learn More about Amazon, Walmart and Jet. Manage Feeds from various Distributors directly with your website, sync pricing and inventory changes automatically every day while being able to add new products easily. Learn More about Distributor Management. 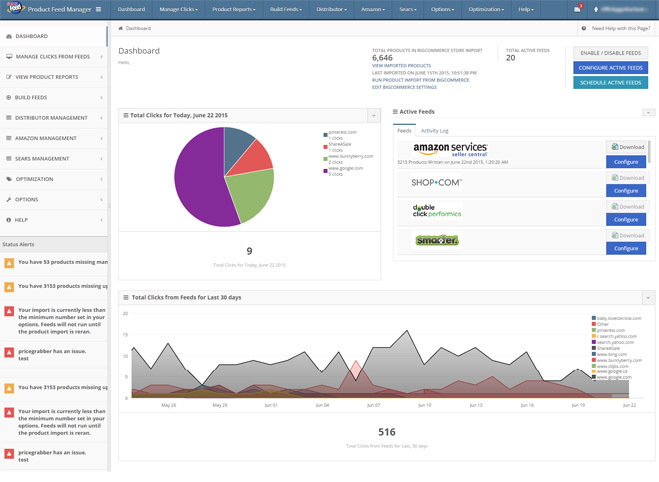 View traffic from participating shopping engines. View Clicks, and your ROI through our easy to use interface. Imporve your ROI by reviewing your traffic on each shopping engine and remove products that do not convert. Remove products from feeds using various filters such as by category, manufacturer, price or keywords. 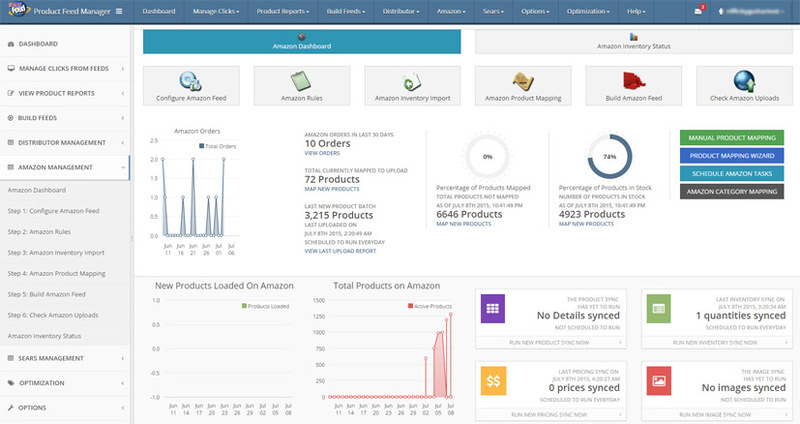 Manage Amazon, Jet, Walmart, and Sears Products from our easy to use dashboard. 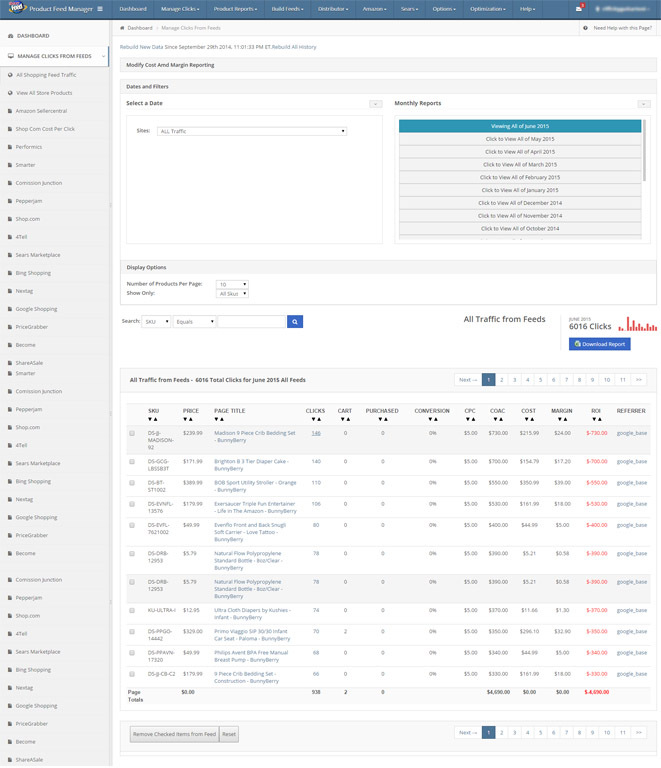 You can view how many products get listed and synced on a daily basis. 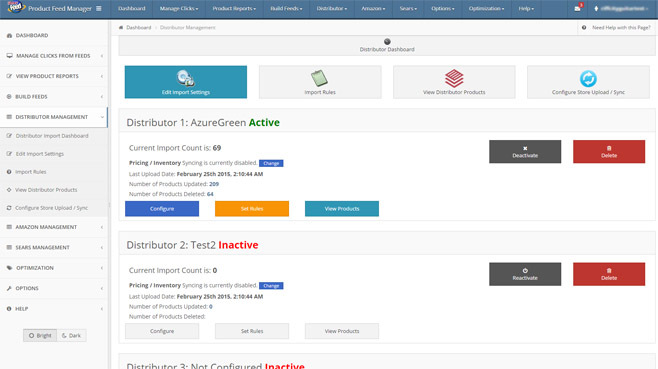 View products from each distributor and enable or disable distributors as necessary, sync pricing and inventory changes. Powerful importing that allows for multiple files for pricing and inventory. Virtually any number of files and formats can be supported. We support various e-commerce solutions for automated product import. If your e-commerce solution is not listed, we can also import from any file in any format. *Silver Plan Only, No Trials for Amazon, Sears, Jet, Walmart, Gold Plan or Distributor Management Accounts. Setup fees may incur if import requires parent / child relationships. Â© Copyright 2019 SmartFeed Inc.